Supported by the National Lottery Heritage Fund. Charlie Phillips moved to London from Jamaica in 1956 and began to document life in his local community, taking photographs with a Kodak brownie camera he had been given by a black American serviceman. Phillips lived in Notting Hill, an area of London which had a large British Caribbean community following mass migration from the Caribbean in the immediate post-war period. His personal photographs of local people take on the political issues of the time. 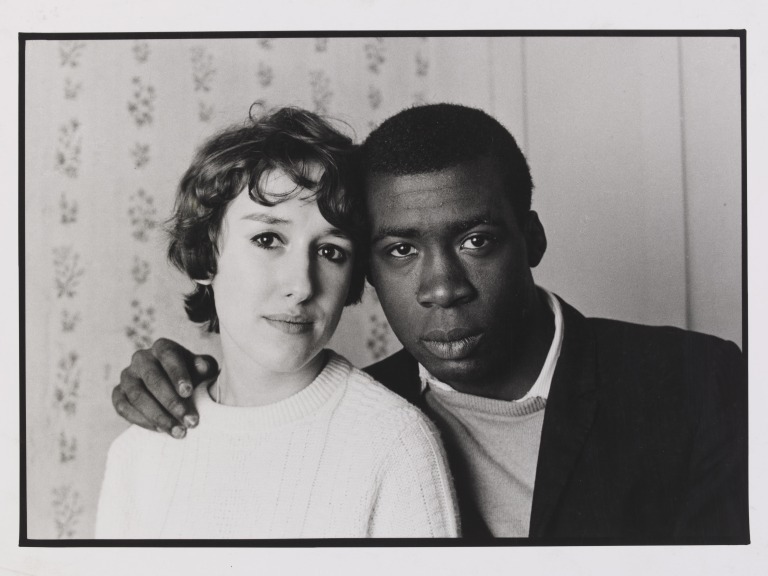 This couple’s connection to the Notting Hill area recalls the eruption of racial hostility there less than a decade earlier, when groups of white youths sought to divide Notting Hill’s mixed-race community in a series of violent attacks. The events became known as the Notting Hill race riots (1958), and were thought to have been started when a group of white men assaulted a white woman on the basis of her marriage to a black man. The V&A acquired ten photographs by Charlie Phillips as part of the Staying Power project. Staying Power is a five year partnership between the V&A and Black Cultural Archives. The project aims to explore black British experience from the 1950s to the 1990s through photographs acquired by the V&A and oral histories conducted by Black Cultural Archives. 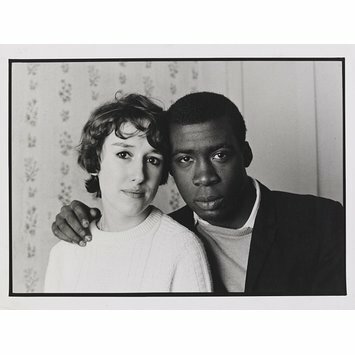 A black and white photograph a mixed race couple. A young black man wears a suit jacket over a pullover with a shirt and has his arm around a white female wearing a jumper. Their heads touch in the middle of the image. Behind them is floral wallpaper giving way to a wooden wall. The V&A acquired this photograph as part of the Staying Power project. Staying Power is a five year partnership between the V&A and Black Cultural Archives. The project aims to explore black British experience from the 1950s to the 1990s through photographs acquired by the V&A and oral histories conducted by Black Cultural Archives. Phillips moved from Jamaica to Notting Hill in 1956.
following mass migration after the Second World War. London during the 1960s and ’70s.